UPDATE: MP3 now available for download - Yamasuki. Thanks, Finder's Keepers! 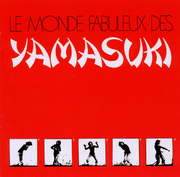 One of my favorite recent records is a reissue from 1971 called Le Monde Fabuleux Des Yamasuki. It's a wild amalgam of psychedelic pop, fuzzed out guitars, children's choirs and karate chants, coming together to create a sort of multi-kulty rock opera. The record started off as a cross-cultural dance project intended to bridge gaps between Europe and the Far East, but the two French pop producers in charge of the music quickly got carried away, learning Japanese, importing children's choirs and even hiring a famous Judo master from Japan to yelp and roar in the background. OK, so I'm a sucker for yelping. Especially Japanese yelping. The title track, Yamasuki (streaming Realaudio or streaming MP3) became a French dance craze in the summer of 1971, but the song and the record quickly faded away. BBC DJ John Peel's Dandelion record label reissued one of the songs (AIEAOA - streaming Realaudio or streaming MP3) in Britain, but it too faded quickly into obscurity. Something about that song sticks with people though, and in the 70's a band in Zaire called Black Blood scored an international hit with a cover, now called A.I.E. Mwana (streaming Realaudio or steaming MP3). Three British models heard the Black Blood version in a French disco, and went back to England to form Bananarama, recording a cover of it under the title Aie A Mwana (streaming Realaudio). The Bananarama version got heavy airplay on College Radio in the early Eighties, including on my own show on WCBN in Ann Arbor, Michigan. When I came to FMU, I heard the Black Blood version and thought I had found the original. In retrospect, the Banarama cover is absolutely anemic, but it shows how far the proper haircut and good song selection can take a band. Thanks to Finders Keepers records for reissuing the Yamasuki record and setting the story straight. While we await permission from Finders Keepers to post a downloadable MP3, here's a third streamed tune from the reissue - a tune called Yamamoto Kakapote (streaming Realaudio or streaming MP3). Am I the only one who hears some Black Magic Woman in John Peel's and Black Blood's versions ? I wanted to know if the 'Japanese' sung is real or not. In any case, 'Yamamoto Kakapote' is definitely fake, as it reads 'Il y a (y'a) ma moto qui a (qu'a) capoté', meaning 'My motorbike went of the road' or 'was in an accident' in French. I think that yamasuki (the song) was originally a Belgium project made by the producer of Will Tura (a famous flemish singer). Thank you Ken - this has been plaguing me for a LONG time. Liked the song when I heard it from Bananarama, but wished that someone with soul could have put it out. Heard the Black Blood version once in Spain, and couldn't find it - infinitely funkier (incidentally, now released in a compilation "African Disco" on the Nascente label). Now I've heard Yamasuki, it has soul too (also now released on CD from Finders Keepers).